Strand shopping centre goes Bug Crazy this February Half term! The Strand shopping centre has unveiled it February Half term activity as it goes Creepy Crawly Crazy! The Strand’s popular craft Zone will be open Tuesday 19th to Thursday 21st of February from 11am – 2pm making bug crafts and is totally free just simply turn up and join in the fun! On Wednesday 20th of February The Strand will welcome the brilliant Creepy Crawly Show. 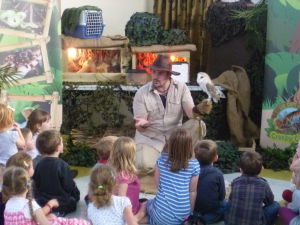 The Creepy Crawly Show will be bringing along a range of creatures for shoppers to touch and ask questions about. This interactive activity is also accompanied by a challenge get out and about and get bug hunting to enter the centre’s bug hunting competition. Simply visit The Strand and find out some amazing facts about the creatures on show, ask the experts and then go hunting for yourself. The Strand want to see your bug hunting pictures, simply send them to The Strand’s facebook page to be in with a chance to win a bug hunting goodie bag including your very own butterfly farm! The Strand’s facebook competition opens on the 20th of February and you have until the 1st of March to get your photos sent into the page to be in with a chance of winning. One image will be selected by The Strand Management team as the winning picture. Please find attached a selection of images for your publication. I had a quieter yet still enjoyable week this week in which I had the pleasure of attending 4 engagements which varied from attending the Annual Ceremony of Signing of the High Sheriff Rolls to attending the S.A.F.E Meeting in Southport. It was with great delight that I accepted the invitation from StedyChefs Learning Centre. It was very pleasing and eye-opening to see what the new Learning Centre entailed and how the Staff aid adults with learning disabilities as well as courses for Hospitality Training and Work-Essential skills. It was fantastic to see the positive impact the Learning Centre has on the community. It was intriguing to see what the students had to say about how much the Learning Centre has such a positive impact on their lives. The S.A.F.E. (Southport Access For Everyone) meeting was an engagement which filled me which much excitement and interest about what the meeting was about as well as finding out more about S.A.F.E as an organisation. 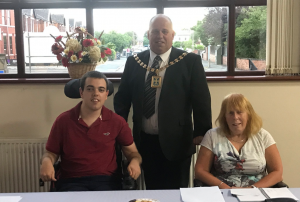 SAFE is a small voluntary organisation working to improve access for disabled people of all ages to both premises and services in the Southport area. The S.A.F.E meeting was to review any problems between the last meeting and this meeting. It was a pleasure to be there and it was also an honour to give them a little insight of what my Mayoral job entails. 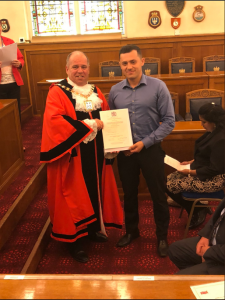 It was a pleasure yet again to be invited to another ceremony in which the High Sheriff sings the roll of High Sheriffs of the county in front of the High Court Judge and the other Judges. It is always such an honour to be invited to these engagements as it gives me the opportunity to meet other Mayors of the Boroughs of Merseyside. The prince’s Trust Team Programme is a 12 week personals development programme, this is delivered by the Merseyside Fire and Rescue Service. 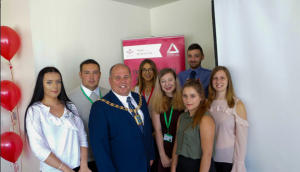 It’s a great way for young people to build their confidence, and participate in work experience as well as to gain life skills. The presentation was to congratulate and celebrate all of the graduates who have completed the 12 week programme and it gave me the opportunity to congratulate and celebrate with the students as well as thank the staff for all of their hard work they have put in and to appreciate how much of a success this programme is.